Although Theda – born Theodosia Goodman in Ohio, 1885 – didn’t star exclusively in horror films (such as the distinction could be made at this early stage in film) she became well-known for playing the archetypal ‘vamp’ – a desirable femme fatale and a woman to be reckoned with as, amongst others, the famous wantons Salome (1918) and Cleopatra (1917) as well as a host of she-devils and sinners. Her chosen name is rumoured to be an anagram of ‘arab death’, which, if true, neatly conflates the blend of the exotic and the macabre which she was known for, and which publicity campaigns happily played upon during her film career. Sadly, most of Theda Bara’s work – like so many silent films – is now lost. A few seconds remain here and there, but one film has come down to us complete: A Fool There Was (1915). 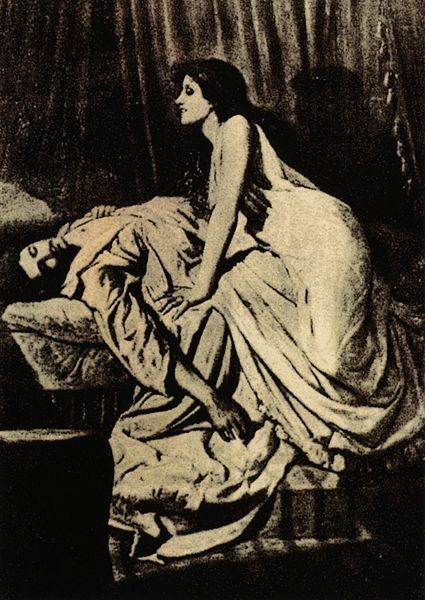 This film was based on a Rudyard Kipling poem, which itself was based on ‘The Vampire’ (1897) by Philip Burne-Jones – a painting which shows a voracious young woman presiding over the lifeless body of her lover (below). Incidentally, this painting was exhibited in the year Bram Stoker’s Dracula was first printed, and – although there is no suggestion of blood-drinking, Theda Bara’s film has been credited as the first ‘vampire’ film (and she is credited only as ‘the vampire’). This anxiety about the potential destructive power of female lust and ambition has stayed with us, and the threatening women which embody it have formed an important part of the modern horror genre. So, Theda Bara, the first screen vamp, I salute you! This entry was posted on Friday, February 5th, 2010 at 11:15 am and is filed under theda bara, vamps, women in horror. You can follow any responses to this entry through the RSS 2.0 feed. You can skip to the end and leave a response. Pinging is currently not allowed. Actually, it has been strongly suggested that the wife’s snub of “The Vampire” when they first meet is the catalyst for the whole film – that taking her husband is the Vamp’s revenge for that rudeness. There is more speculation that goes along with this – such as how racism might also be a part of it – e.g., the lawyer’s wife and all her friends are fair complected & hire only white servants, whereas The Vamp is very dark & hires Oriental & Black servants. It sounds subtle (or, perhaps, incomprehensible) to us, but I’m sure it was done deliberately in the film to send a very clear message. Entries (RSS) and Comments (RSS). 14 queries. 0.234 seconds.